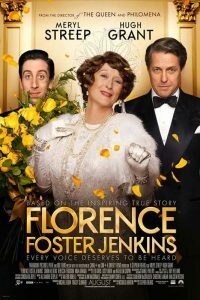 I remember first hearing the unusual story of Florence Foster Jenkins about 30 years ago. A friend had a recording of Florence singing the “Queen of the Night,” an aria from The Magic Flute. We laughed and laughed at the awful singing of Florence. He told me that Florence had been a cult celebrity many years ago and crowds would come to hear her sing, barely containing their laughter. Florence was a wealthy New York socialite and patroness of the arts who rented out Carnegie Hall and other concert venues so that she could sing, quite badly, before enthusiastic crowds. I wondered then if Florence knew that people were laughing at her. How did she feel about that? Florence’s story has been adapted into a new movie, with the great Meryl Streep as Florence and Hugh Grant as her husband, St. Clair Bayfield. Written by Nicholas Martin and directed by Stephen Frears, who also directed such fine character studies as Philomena and The Queen, the film tells the story of Florence in her later years, leading up to her famed Carnegie Hall performance in 1944. Yes, Florence Foster Jenkins allows us to laugh at her bad singing, but it also attempts a more in depth study of her personality. The movie presents Florence as a woman who loved music, and wanted to sing, but had little talent. St. Clair encouraged her and hired the finest voice teachers for her. She enjoyed performing so much that no one told her the obvious: she couldn’t sing. At first Florence sang for invited guests of friends and members of her music societies. St. Clair would protect her from anyone who would laugh at or criticize her singing. Without her husband’s knowledge, Florence made a recording during World War II and gave it to radio stations. It became a hit with many, including soldiers, and led to the Carnegie Hall Concert. Florence rented out the hall and gave 1000 tickets to servicemen. No doubt these listeners were laughing at Florence, but how could she know this? For the first time at Carnegie Hall Florence heard the laughter. She was startled, but the crowd settled down, and Florence carried on. Florence suffered from syphilis, which she received from her first husband. In the movie we learn that she was taking mercury and arsenic to control the disease. So she was ill from this disease that eventually took her life soon after the Carnegie Hall performance. A frustrated actor, St. Clair took care of Florence and, in his way, loved her. Still he benefitted from her wealthy lifestyle. Like much of their lives, their marriage was complex. Because of her illness, they maintained separate residences, and St. Clair had a secret life she of which Florence was unaware. Meryl Streep gives another triumphant performance as Florence, and, remarkably does her own singing. It’s a good bet that she will receive another Oscar nomination for her fine performance as Florence. The film celebrates her spirit and ability to delight her audiences, even in ways she did not realize. Hugh Grant is also very good as the equally complex St. Clair. Simon Helberg (best known for TV’s The Big Bang Theory) steals many scenes with his expressive face as Florence’s accompanist, Cosme McMoon. Florence Foster Jenkins is a beautiful film to watch, with impressive period sets and costumes. Especially noteworthy are the theatrical costumes and wigs worn by Florence during her performances. Florence Foster Jenkins can be enjoyed on many levels. Even though her singing can still make us laugh, the movie shows that there is a lot more to Florence than hitting some very wrong notes.